Alrighty, no more Mr. Nice Guy. In this week’s film, only one car appears onscreen. 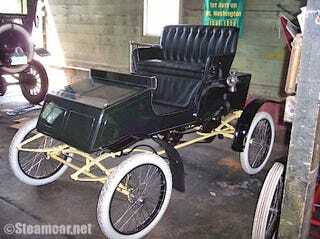 It does so extremely briefly, and to make things more difficult, the car is a 1902 Locomobile steam car. This is probably almost impossible to get without cheating. But I’m still not allowing cheating. Hop to it! EDIT: I’m calling this one, and giving it to jariten1781. The film was The Prestige (2006) starring Hugh Jackman, Christian Bale, Scarlett Johansson, Michael Caine, and David Bowie.